The previous chapter ended with the circumcision of John the Baptist, the symbol of a willing entering (on our side) of the Blood-covenant with Christ: a willing surrender unto God, that all of the process of God’s work on the cross, unto the annihilation of our old life, might be done unto us. After the promises without repentance of God’s Word the NEW LIFE of God, which will then be poured into us, will follow such faith and attitude of life. In this light it is understandable, that in this new chapter the NEW LIFE of God is depicted in the birth of the Lord Jesus Christ Himself. God’s profound wisdom lies herein: John the Baptist had to be born earlier, and only thereafter God’s Christ: first heartfelt repentance and surrender must be born in us before NEW LIFE of God can be produced in us; because, as we saw, this NEW LIFE could only develop within us on the pure and holy foundation of Jesus Christ. Here is a brief report of the first census in the Roman empire. This census had taken quite a lot of doing: everyone had to be registered in the town or place of origin of the family. This most probably had to do with civil rights. In any case, this registration was done in connection with taxes, that were to be charged. Thereafter such censuses were to take place once every 14 years in the Roman empire. Obeying the command of the emperor of Rome, because Israel in those days was under the dominion of the Roman Empire, Joseph, too, went with Mary to whom he was to be married, to Bethlehem, the city of the origin of the entire house of David, unto which Joseph as well as Mary belonged. Mary then was in an advanced state of pregnancy of the Child Jesus: it was about the time that she should deliver. One understands how difficult that must have been. This gives us a striking idea, how a Christian who is truly full of Jesus, often has to suffer painfully the things of this world. Here Mary already stood in the adumbration (the most central, darkest part of the shadow)(or fore­shadow) of the cross, which would also crucify her own life, her “I”/self, completely. Quietly, and without grumbling, with a patient heart, Mary must have gone this for her difficult way beside Joseph. 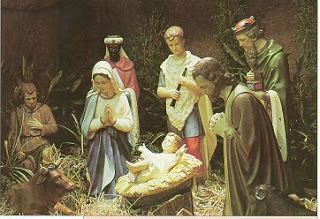 He, Who is the NEW LIFE, the Resurrection Life, Himself, was born in a manger, in a stable for animals. He must be born there. God had determined that. That stable was the place predetermined by God. In that dirty stable for animals, where also was dung, He must be born; because the human heart into which He must be born in the Spirit, is also dirty, like a stable for animals, because of all the sins of the people. This explains why He had to be born there, exactly there. He was laid in a manger, because He was to be food, the Bread of Life, for us. When we eat Him in the spirit; i.e. when we open our heart unto Him, and allow Him (access) into our heart and life, then we will receive NEW LIFE. I repeat: Jesus Christ can only really become the Bread of Life for us, when we, in answer to the call of the preacher unto repentance (in those days John the Baptist), repent sincerely. If we thus have communion with Him, as our Prince of Life, by accepting His Word and by having all His promises in our life fulfilled by Him, then we know, by our faith, that the ETERNAL LIFE, the Kingdom of God, enters into our heart and life. CLICK HERE if you want to continue this ‘verse by verse’ study of LUKE Chapter 2. This entry was posted in Bible study 'verse by verse', for FREE, LUKE 'verse by verse', NEW LIFE in Christ, sanctification, the FULL Gospel, The Holy Gospel explained and tagged Christians - priests of God, God calls us to repentance, Jesus - the High Priest, John the Baptist, sanctification, the court-life of the believer, The Gospel of Luke, the NEW MAN in Christ. Bookmark the permalink.